What is it about some shooters that allow them to hit targets at practically any distance? You’d swear it’s talent or simply having all day to practice right? The first place to start when you’re trying to master any skill, especially shooting is taking small, baby steps with your fundamentals. Kinda hard to hit targets if you don’t know where the bullet is going right? Look at golfers, they know exactly how far they hit each club… you too should know the point of impact with each one of your guns. A great way to do this is to shoot your guns at short distances, and then back off in small increments. For example, try shooting at 3 yards, then 5, then 7 and so on. Take note of where the bullet is impacting the target and you’ll know exactly how to adjust. Going back to the golfer example, they also know how to adjust their shots based on wind conditions. You wouldn’t think wind would impact a bullet flying thousands of feet per second, but it actually does. Not only impacting the bullet but strong enough winds can move the gun around messing up your aiming. After you’ve dialed in your impact points, purposely practice your shooting in windy conditions going after targets at long distances. I know, I know this sounds horrible but hear me out. Notice how Jerry used a red dot sight on his gun? Well, even the best need help. It’s the reason why pro athletes hire coaches and watch film… they try to get every edge they can. 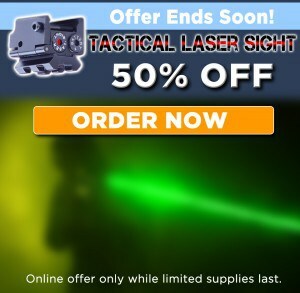 In this case, you can pick up red dot and laser sights for relatively inexpensive prices… but the feedback you get on your groupings will last a lifetime. Once you can use technology to pinpoint your misses, it’s now much easier to make corrections. 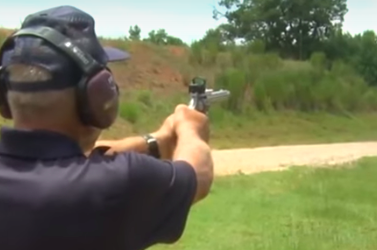 Now, this is just a small sampling of the baby steps you can take, but master these three and you’ll be surprised at how you can hit targets, at long distances even with a revolver like Jerry. RELATED: You’ve Been Holding Your Pistol ALL WRONG for Years! ?